5-room terraced house 270 m2. Renovated, comfortable and beautiful furnishings: large entrance hall. Exit to the veranda. Large living/dining room 45 m2 with open-hearth fireplace and TV (flat screen). Exit to the veranda. Large, open kitchen (4 hot plates, oven, dishwasher, microwave, electric coffee machine) with bar, dining table. Exit to the garden. Sep. WC. Upper floor: 1 large room with 1 french bed (160 cm, length 200 cm). Exit to the terrace. 1 room with 1 french bed (160 cm, length 200 cm). 1 large room with 2 beds, hand-basin and shower. 1 room with 1 french bed, hand-basin and shower. Exit to the balcony. Bathroom, sep. WC. Boiler (200 litres). Large terrace 16 m2. Terrace furniture, barbecue, deck chairs. View of the garden. Facilities: washing machine, children's high chair, baby cot. IPod docking station. Reserved parking (fenced). Please note: maximum 1 pet/ dog allowed. On the ground floor, pantry with sink and summer shower. Veranda 40m2. Comfortable terraced house Salut l'Artiste. In the resort, in a sunny position in the residential district, 700 m from the sea, 700 m from the beach. 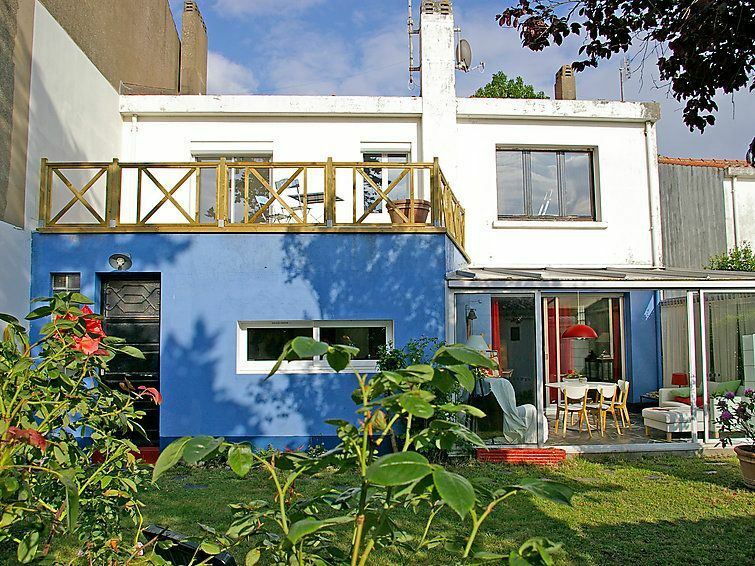 Private: garden 350 m2 (fenced) with wildlife garden and flowers, parking (for 3 cars) on the premises. Grocery, supermarket 650 m, restaurant 1 km, bar 1 km, sandy beach Plage des Présidents 700 m. Nearby attractions: Zoo, Thalassothérapie, Talmont St Hilaire 20 km, Ile de Noirmoutier, La Roche sur Yon 40 km. Hiking paths: GR8. Please note: car recommended. Suitable for families.